Knee pain can be caused by things, such as an injury, trauma, or arthritis. Depending on the cause, various treatments may be used for knee pain. Symptoms of knee injury and arthritis can include pain, stiffness, and swelling. 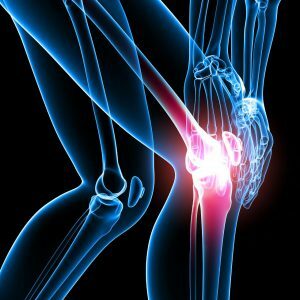 In a study involving radiological evidence of knee arthritis, 50% of subjects with chronic knee pain had osteoarthritis. Additionally, 50% with knee OA did not experience. Another study has found that the prevalence of knee pain has increased by 65% from 1974 to 1994. Age- and BMI-adjusted prevalence of knee pain increased by about 65% in NHANES from 1974 to 1994 among non-Hispanic white and Mexican American men and women and among African American women. In the FOA Study, the age- and BMI-adjusted prevalence of knee pain and symptomatic knee osteoarthritis approximately doubled in women and tripled in men over 20 years. No such trend was observed in the prevalence of radiographic knee osteoarthritis in FOA Study participants. After age adjustment, additional adjustment for BMI resulted in a 10% to 25% decrease in the prevalence ratios for knee pain and symptomatic knee osteoarthritis. Radiographic evidence and self-reported pain were used to define symptomatic knee osteoarthritis. The age- and age- and body mass index (BMI)–adjusted prevalences of knee pain and osteoarthritis at later examinations were compared with that of earlier examinations by using the ratio of the prevalence estimates. What are the structures of the knee joint? The knee is the largest joint of the body. The surface of the bones inside the knee joint is covered by articular cartilage, which takes in shock and helps give a smooth surface for moving the knee joint. The upper and lower bones of the knee are separated by two discs, which are called menisci. The upper leg bone (femur) and the lower leg bones (tibia and fibula) are connected by ligaments, muscles, and tendons. Knee bursitis. Some knee injuries cause inflammation in the bursae. ACL injury. Anterior cruciate ligament (ACL) is stretched, strained, or torn. Torn meniscus. Twist and turns of the meniscus (knee cartilage) can lead to tearing. The menisci are formed of tough, rubbery cartilage, and they act as a shock absorber between your thighbone and shinbone. Fracture – The bones of the knee, including the kneecap (patella), can be fractured or broken by being weakened from osteoporosis, or by being in an accident or fall. Patellar tendinitis. The thick, fibrous tissues that attach muscles to bones are tendons, and these structures can become inflamed or irritated, resulting in tendinitis. What symptoms are associated with knee pain? Ask questions concerning when your knee begin hurting, what you were doing, how severe the initial pain was, and what you did to help it. Check your knee for pain, tenderness, bruising, warmth, and swelling. Maneuver your knee is different positions to check the structures. Push and pull on your knee. Suggest one or more imaging tests, such as x-rays, MRI’s, CT scans, and/or ultrasound. Order other tests, which may include blood work and arthrocentesis (a procedure where they remove fluid from the knee joint with a needle for the lab to examine). Physical therapy. Strengthening the muscles around your knee will make it more stable, alleviate pain, and prevent further injury. Corticosteroid injections. The doctor can inject the knee with a corticosteroid, platelet-rich plasma, or another solution. Oral corticosteroids. These pills may help pain for a few months. Platelet-rich plasma (PRP) injection. PRP contains a concentration of your own platelets and many different growth factors, which promote healing and help reduce inflammation. Hyaluronic acid injection. Hyaluronic acid can be injected into your knee, and it helps to improve ease pain and mobility. Partial knee replacement surgery. Your surgeon replaces only the most damaged portion of your knee with parts, usually made with plastic and metal. Arthroscopic surgery. The doctor uses a fiber-optic camera, and long, narrow tools inserted through just a few small incisions around your knee, to repair damaged cartilage and reconstruct torn ligaments. Total knee replacement. Your surgeon cuts away damaged bone and cartilage from your kneecap, thighbone, and shinbone, replacing it with an artificial joint. At Desert Institute for Spine Care, Dr. Yeddu offers top nonoperative pain treatments in Gilbert AZ. This includes knee pain treatment that is comprehensive, with most insurance being accepted. Call us today!